A donor at PVF has given substantial financial support to Habitat for Humanity, the program that builds affordable housing. The Bay Area chapter out of San Francisco has undertaken over 100 housing projects and I just visited the Daly City construction project which will be 36 condominium units, 2 bedrooms, and 1,000 square feet each. The project is being built by volunteers with minimal professional paid workers. One of the paid professionals was an AmeriCorps volunteer a few years back. 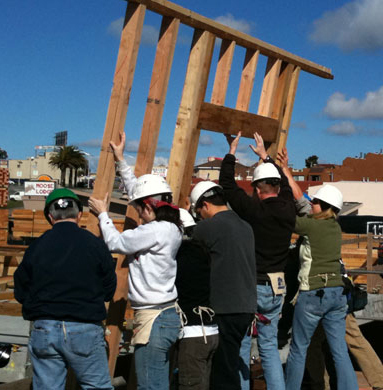 Other volunteers are retired builders, many of the workers are learning skills on the job. Habitat is ingenious in finding funding and being able to offer for sale a two bedroom, 1,000 square foot unit for $250,000 with zero interest rates and no down payment. Owners do contribute 7,000 hours of ‘sweat equity’ in helping build their own unit and the entire complex. This entry was posted in Uncategorized and tagged Daly City, housing, Where's Bill. Bookmark the permalink.